Mini size measures 4.6 x 7 inches and has 7 punches. 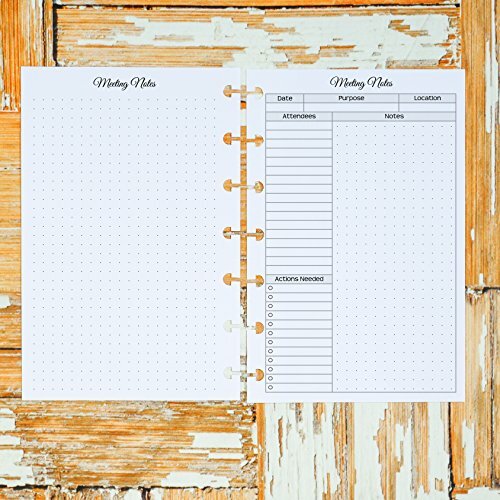 It is compatible with the mini Happy Planner. Printed on 32lb paper (80lb text weight / 120 g.s.m.). Features dot grid for notes, space for attendees, location, purpose, date, and actions to be taken. Back side of pages is more dot grid for extended note taking or graphs. This is a planner refill, it does not include a cover or discs. You are purchasing pages only. If you need a cover or discs, please see our store. Includes 25 double-sided sheets (50 pages) per pack.